Let’s really look at this situation; because it is a very serious one, John Edwards have dropped out of the presidential race. 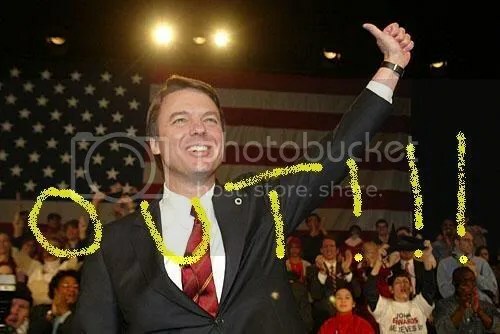 At this time John Edwards has not endorsed a particular candidate. The real issue or shall I say situation is where does Edwards votes go to, Will they vote for Hillary or Obama? Why is this suddenly a surprise that Edwards is dropping, did he have the money to stay in? What primary did Edwards win? Was he even a strong enough candidate?? I will say that Edwards does have a lot of views that will change the face of this nation, but he is no PRESIDENT. Be cautious as to who you vote for make sure you vote for the issues. RACE and GENDER should not matter. Some African American voters are weary about Senator OBAMA speaking simple rhetoric and not knowing anything about how to run the country. Others fill that Hillary has no real concrete issues that will transcend this nation past the state we’re in now. Now, Where does the Edwards voters turn to.. We shall see but political analyst have predicted that 75% of the voters will roll with Obama on this one. Edwards is more likely to support Obama because of their youth and their message of CHANGE and his adamant issues that he disagrees with Hillary on! John Edwards will be meeting in New Orleans to discuss his on going support with poverty. Phone calls were made to OBAMA and CLINTON on poverty issues that he wants them to continue to focus on. If you thought the last Democratic debate was interesting… you probably need to watch the one Thursday airing live on CNN 8PM! You are currently browsing the archives for the JOHN EDWARDS category.